DO-10778-82 was succesfully added to your cart. 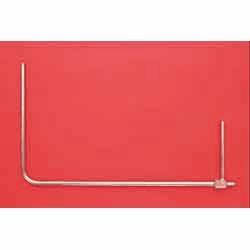 160-12 Stainless Steel Pitot Tube 12"
We want to use this Pitot tube to measure velocity (water) in a hydraulic flume. Any problems with that? This is rated to resist temperatures up to 800F, as long as you do not exceed those temperatures or introduce any other chemicals that will not be compatible with stainless steel there will be no issues.